If you are using social media and spend more amount of time scrolling through the feeds every once in a while, you might be well aware with stories, or video status. 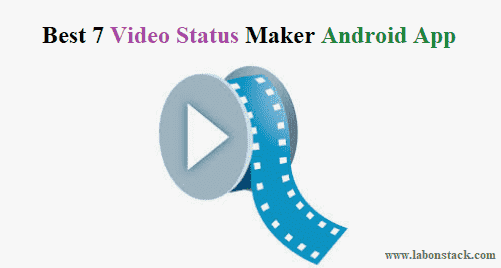 In this article, I have listed the Best 7 Video Status Maker Android App. In social media, the meaning of it is different in every social media platform like some call it “Story” and some call it “Status” but basically both of these have become almost identical lately. First, Snapchat introduced the stories and after that many other social media platforms adapt it as well. The point is, stories/status are everywhere now and people are using them a lot. Using this video status maker app you can make video status or stories for social media like WhatsApp, Facebook, Twitter, Google+ and more. Most social media have a time limit for the status/stories; this app can split a video into small slices so that you can easily post is as a status/story. KineMaster is the only full-featured professional video editor for Android, supporting multiple layers of video, images, and text, as well as precise cutting and trimming, multi-track audio, precise volume envelope control, color LUT filters, 3D transitions, and much more. For professionals and amateurs alike, KineMaster offers an unprecedented level of control over the mobile editing process, and for artists and educators, handwriting layers allow you to draw directly on the video. Video Maker is the easiest video editing tool/slideshow maker/effect camera to make stylish videos/photos/vlog. With minimum operations, a spark video combined with magic effects, fantastic filters, popular themes, special doodle, gif memes, slideshow animation, gif stickers, hot music will be shown. A large collection of best video songs to share on your WhatsApp status. VidJoy gives you get access to the songs which are being loved by everyone. Quickly share short WhatsApp videos on popular social networks. Whatsapp videos are available in short size with the best quality. On public demand, they upload the best HD full-screen videos status. You can share these statuses on WhatsApp, Instagram, and Facebook and they’ll look totally beautiful in every aspect. Lyrical.ly is the best app to make lyrical video song with your photo and video. You can make 30-sec video status in 1 minute. This is an animated video status maker application You can easily create for your video many beautiful and attractive animated effects. My Video Status Maker has something new concept you can make the lyrical video of your own beautiful photos. There is a new craze on social media to share Lyrical Video Songs. My Photo Lyrical Video Status Maker is an app that provides lyrical videos for sharing on social media like 30-sec video status, 30-sec lyrical video maker, 30-sec video, 30-sec romantic video, 30 seconds video status, 30-sec video maker, myristates, my pic status, my pic status. My Photo Lyrical Video Status Maker has something new concept you can make the lyrical video of your own beautiful photos. The lyrical video for WhatsApp status makes awesome video status. WhatsCut Pro is the most powerful and smart tool to create and share videos/audios on multiple social media platforms and chats messengers: Whatsapp, Instagram, Facebook, IMO etc. Easy to edit and trim video/audio content from phone gallery.